When working with colored mortar, uniform color requires consistent material proportioning. With SPEC MIX, this isn’t a problem. SPEC MIX® colored mortar consists of pre-blended Portland cement or Masonry Cement, lime, and sand to produce uniformity from batch to batch. This not only vastly reduces the chance for error in the field, but also is a more efficient and cost effective means to create a beautiful finished product in a timely manner. Since no field measuring is required, your crew can concentrate on their craft. And because the product is specially pre-blended we offer maximum color effect and proper dispersion throughout the batch. Our dedicated staff, equipped with the latest color matching software and a vast library of tens of thousands of colors combinations, can match the color the architect and building owner needs to complete their vision for the finished project. The Color Matching Program also allows the client to be integrally involved in the selection of the proper hue and color space with a custom produced set of color chips and sample bags if a mockup wall is required. 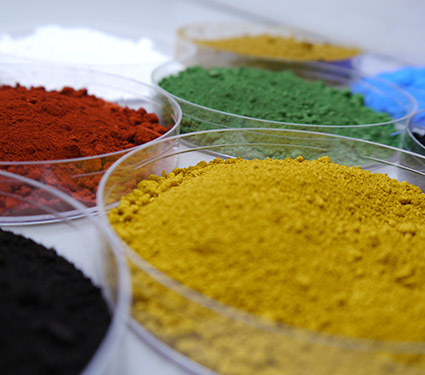 Our pigments are finely milled synthetic iron oxides, the strongest and most stable colors available on the market today, from the industry leader in iron oxide pigments. This ensures that we can replicate your specific color and quality batch after batch. As far as durability is concerned, SPEC MIX® colors are lime-proof, sunfast and inert. The product is environmentally safe while providing a beautiful enhancement to every application. SPEC MIX® meets or exceeds the criteria of ASTM C 270. In early 2014 we are introducing a new palette of colors, representing the latest technology in color consistency in a durable and easy to use package for your office and in the field. This newly designed color box will allow you greater selection of consistently used colored mortars on jobsites throughout the northeastern United States. Of course we are also available to create a custom color specifically for the job. All SPEC MIX® colored mortars, stuccos, and custom blends are available in appropriate strengths and proper mix designs to spec for the job. Whether the job is a small re-pointing job, matching the existing mortar of a large retail, stadium or school, SPEC MIX® colored mortars and grouts are the ideal partner in producing quality and consistency batch after batch. Click the image to the right to see our standard colored mortars. (Type O, N, S & M) are available. Please see your rep or call for more details.